You are what you eat – literally. We as human beings love our food. Think of all the money being made on cookbooks, food shows on TV, diets, dietary products and programs, and advice on what to eat and not eat. With all that information, you would think we would be a better nourished society. We may be overfed, but we are also seriously undernourished. Empty calories – food with poor nutritional content – makes up the majority of what most of us eat. And it’s killing us. Scientists estimate that at the last turn of the century (2000), the combination of a poor diet and lack of physical activity was the underlying cause in 16% of deaths in the United States, and many believe that the true number may be even higher. Unhealthy eating can kill you! By some estimates, the number of deaths caused by obesity is now greater than the number caused by tobacco. Scientists have debated what it is about diet that impacts health most. Is it sugar, fat, sodium, animal protein (or lack thereof), or something else? 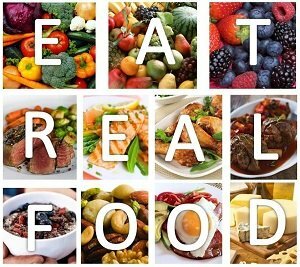 When looking at all the eating plans and diets promoted for good health, there is a clear winner: REAL FOOD! There’s no other way to interpret the balance of the scientific evidence. Tweet that. That means you don’t need to spend lots of money or time or mental anguish trying to figure out what specific diet you should be eating. Just keep it natural! And that means unprocessed. “Processed” means foods that are not natural, or that are not as close to their natural state as possible. They usually have added salt, sugar, flavorings, preservatives, or other chemicals. Refined grains fall into this category because of how differently they react in the body compared with whole (natural) grains. Processed foods usually have a longer shelf life, come in a package, and are often highly flavored. Processed foods can become highly addictive. The added chemicals and flavoring, and the rapid increase in blood sugar they usually induce, creates a brain craving for more and more. And worst of all, they are strongly implicated in cancer, heart disease, obesity, Alzheimer’s, diabetes, reproductive problems, and autoimmune diseases. Processed foods would include frozen meals (i.e. TV dinners), most breakfast cereals, lunchmeats, white bread, bacon, sausage, canned soup, snacks such as chips, or baked deserts such as cookies or cake. Going unprocessed doesn’t have to mean expensive organic produce, as great as that might be. Most of us can’t realistically grow and pick our own food in today’s world. The idea is to move backward on the “processed” continuum and get closer to the way food began. That of course means whole fruits and vegetables in the produce aisle. But it also means whole grain cereal instead of Frosted Flakes®, whole frozen vegetables instead of frozen ready-to-eat vegetables in sauce, or unbreaded fish fillets instead of fish sticks. If you do nothing else to eat healthier, replace the processed food in your diet with food that is more natural. Look at what you have in your pantry, refrigerator, or freezer, and replace one processed food with one unprocessed food this week. Then replace another next week, until 80-90% of your food is natural. To put it another way, if your grandmother would have recognized it, there’s a good chance it’s unprocessed. And we shouldn’t forget processed drinks. Replace one soda each day with flavored water, and your body and your future will thank you. Changing this ONE THING in your diet will do more than anything else to keep you healthy. Tweet that.